Timber framing is an old world craft characterized by large open spaces and cathedral ceilings. Timber framing has evolved with advanced technologies to produce visually appealing structural building framing using heavy-timber posts, beams and other supporting elements. The timbers come together using rugged mortise and tenon joinery secured with a wooden peg. Timber Quest LLC., embraces both traditional hand-crafted techniques, as well as modern enclosure systems for a wide range of attractive and cost-effective residential, recreational and commercial buildings. 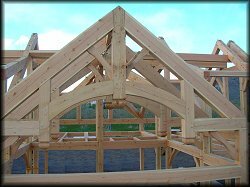 Timber framing construction has once again become the choice for many home owners today. Timber Quest LLC., specializes in aquiring prime timber to supply our shop with optimum materials. In our shop, planning and joinery produces posts and beams with "mortise & tenon", "housed dovetail" or conventional joints. The result is an outstanding, aesthetically pleasing, and structurally superior timber frame. Each frame optimizes the building dimensions and complements the planned use. Whether ordering just the frame, or a whole "closure" package, any design is welcome. From the small un-planned cabin to full-blown custom homes, Timber Quest LLC., pricing will meet the demands of the budget-minded customer.